Court Cottage East is a wonderfully pretty cottage offering good accommodation on three storeys, with the benefit of planning permission to extend if so desired. The entrance hall has a charming flagstone floor with steps leading down to a large sitting room with open fire and sliding doors out to the terrace and garden. This room leads to a spacious kitchen/dining room which also features a fireplace with a wood-burner. The house is believed to date back to the 17th century and offers three bedrooms and two bathrooms upstairs; planning permission is for a further two bedrooms and another bathroom. Constructed of local stone, the cottage has an attractive outlook to the rear from the private walled garden which is peaceful and sunny and includes a stone terrace and a shed, lawn, well-stocked flower borders and fruit trees. 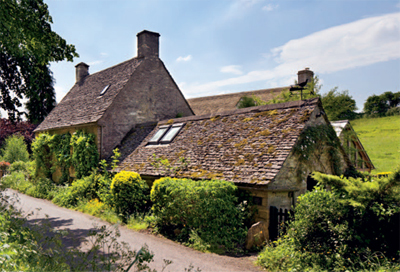 The cottage lies on the edge of the village of Swinbrook and just over two miles from Burford. Oxford is 16 miles and there are excellent local pubs, schools and useful shops. The guide price is £695,000. For further information please contact Jackson-Stops & Staff on 01993 822661 or visit www.jackson-stops.co.uk.